This series follows Joshua and Yann — a Developer and a Designer at Firmhouse — on their one month journey working remotely from Bali instead of their main office in Rotterdam. This is part 2, click here to read part 1. One of the main reasons why we decided to go on this trip was to surround ourselves with people that have similar mindsets. To learn from them and to get inspired by them. But as stated in the previous post, connecting with people in a new and unknown environment can often be a frightening thing. Luckily, the people at Dojo made this really easy for us. While on the first day we talked to absolutely no one, the new members breakfast on day two was where things started to take off. You realise that everyone is in the same boat. A majority are here on their own and share the same thoughts and questions as you do. So being offered a place where you can talk about these things is a great start. As this is such a personal topic you’re able to build interesting connections from the start. Everyone is here for a very specific reason. Everyone has a story. Once you realise that, everything becomes much easier. It takes a huge weight of your shoulder. You start chatting up people more easily. You have dinner with people you just met five minutes ago. Some connections will continue to last. Some won’t. And after a couple of days you make your way through the coworking space like it’s home. The one thing everyone seems to have in common though is an open and non-judgemental attitude. 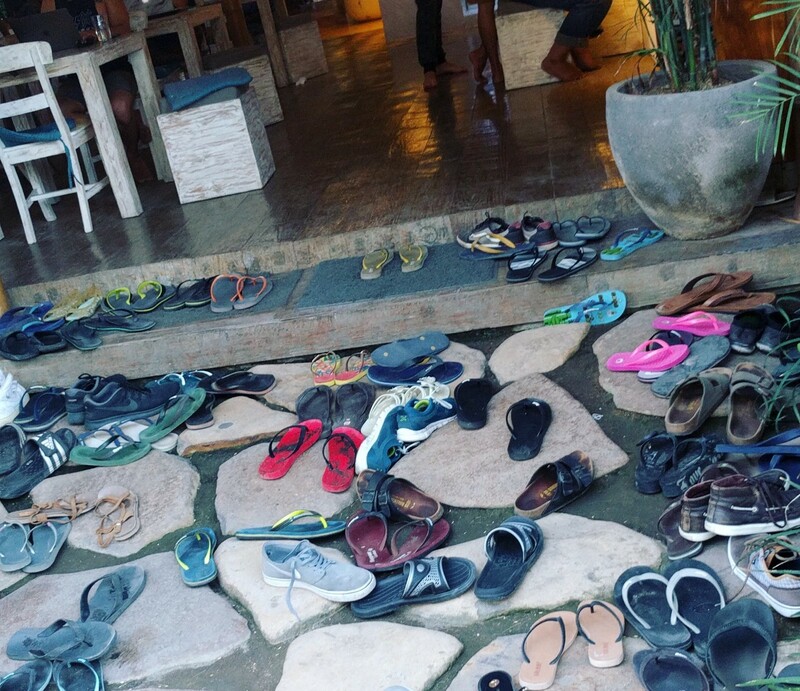 Maybe the traditional Balinese no-shoes-policy is what enforces this to a certain extent. But there’s definitely something magical about a place where everyone is barefoot and walks around in swimwear. In “startups and tech” it’s common practice to just wear whatever you want and I’d argue if I’d ever again take a job that requires a certain kind of dresscode. But coworking spaces here are taking this to another level. It’s one of the things you have to experience yourself to fully understand. After working the regular hours for years, how would we adapt to the different style of working? As mentioned in the previous article, we were planning to start working at 11AM and finish around 8PM to have at least 4h of overlap to our colleagues in the Netherlands. Personally, I’m still adjusting. I noticed that the days where we combined work with other activities — going for a surf before work, getting a massage over lunch or going for a random swim — were the days I thrived the most. If you start working late you need some kind of activity to break out of the routine. Otherwise it’s suddenly 8PM and it feels like all you’ve done so far was spending time in front of your laptop. This is fine every once in a while but I wouldn’t want this to become the norm. And then there are my friends back home, texting me every day, eager to know how I’ve been spending my time so far in this beautiful place. My answer so far has always been the same: I tell them that I haven’t really done much yet besides working and going to the beach every once in a while. In the beginning it felt really boring to give all of them the same reply. But by now I came to a very simple and obvious conclusion: I’m simply working in a different environment now. I’m not in travel mode. I’m not a tourist. I want to enjoy the mundane Tuesday evenings. Let’s walk to the beach and have one beer there. Let’s hop on the scooter for an hour and just go somewhere new. All these little things are much harder to do back home. And I enjoy them very much. Of course I could fill up my days with exciting trips and try to create as much memories as possible but to me that’s not the point. In fact I feel no fear of missing out at all. I don’t have a checklist on my mind. I feel at ease with just being here and getting inspired by the nature and the great people around me.